Located at 1500 West Stearns Road in Bartlett, the Bartlett Church and Academy has made it its mission to reach out to the community. Welcoming everyone – “as you are” – for light refreshments and Sunday morning worship, this faith community seeks to live out the essential truths of its belief. When it came time to add an attractive marker that would help visitors and members to locate the church, its management contacted Mark Your Space. We discussed the faith group’s signage needs and it was decided to add one of our post and panel signs. For churches in Bartlett, IL, this is a great marker option that is attractive, fits into virtually any setting and is budget-friendly as well. This finished sign now identifies the location as the home of the Bartlett Church and also offers the group’s website address for those who want more information on worship times and other events. Are Post and Panel Markers Right for You? This particular signage solution makes wayfinding easy for your venue. Whether you run a business or operate a non-profit organization, any locale that is open to the public benefits from clearly highlighting its name, location address and access to important functions. On school campuses, these signs are commonly seen. They outline the locations of the auditorium, administrative offices, the cafeteria and the sports arena. Hospital properties also frequently rely on these signs in conjunction with arrows pointing to common destinations. Even if you do not need to point the way in any particular direction, you can use a post and panel sign in lieu of a monument marker. This type of setup fits neatly into your existing landscape and can be made to perfectly display your logo colors and signage font. Doing so greatly enhances your visitors’ ability to find you and connect your logo with the business they are in search of. In short, if you need an exterior sign that combines wayfinding with branding and the improvement of name awareness, then the post and panel setup is worth a second look. Posts and panels can be painted in any color. We can use contrasting colors or keep the setup in one hue so that the panel portion’s imprinted business information stands out. To make the sign pop visually, it is possible to add decorative posts, fancy post caps and also custom-shaped panel portions. For example, if you prefer your panel to be in the shape of your logo, this is easy enough to accomplish. For illumination, we suggest the used of internal light sources. LEDs are inexpensive to operate and last for a very long time before they need to be replaced. While it is true that you can just as easily illuminate the sign from the outside with a landscape light source, adding the built-in lights makes the marker easier to see and less dependent on the secondary light. After all, if the bulb burns out in the spotlight that you aim at the sign, your marker is quite literally in the dark until someone notices the problem and fixes the light. To get more information on how a post and panel sign setup could greatly improve the wayfinding and branding for your venue, talk to our friendly signage experts. 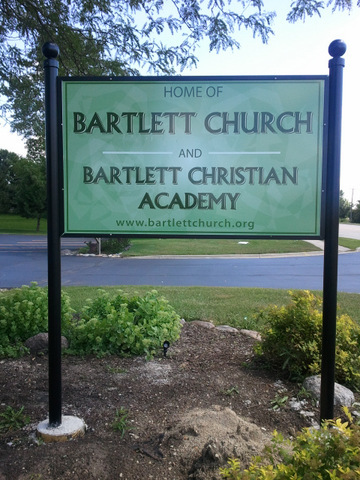 Title: Bartlett Church and Academy Reveals New Post and Panel Sign!